There's a lot of glitter on the floor these days. What is it about the wintertime that makes us think of using so much sparkle? 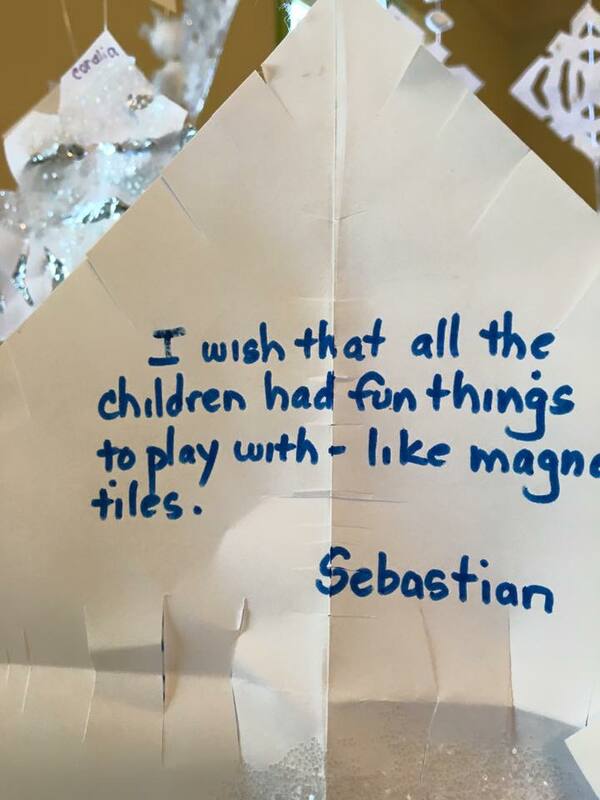 When a child sees the magic of water falling from the sky, and icy rooftops each morning their wonderment and curiosity for the season is contagious. We all want to bring the magic and sparkle inside! This week we've been preparing for our holiday show. The children collaborate on how we design our backdrop and what songs we sing for the parents. The teachers are busy (well, very busy) and the buzz is definitely in the air. BUT, there is something the children are more excited about than the show.... and it's the sneaky squirrels! Children made delicious bird feeders with peanut butter and bird seed last week. But the birds are less interested than the squirrels. The squirrels are sneaking around the playground and it is exhilarating for the children. How lucky am I that I can hear the sweet voices of children singing Jingle Bells and their squealing laughter over the stealthy squirrels, all from my office? Over the past year we have enjoyed so many wonderful memories! Our preschool has been open and growing and building since July 2015. Over the past year we've used Facebook to keep our families updated. In addition, many beautiful newsletters have been sent home to enrolled families. We'd like to return to the blogging world as a way to connect with a wider audience of educators, parents, and community members. We'd like to share ideas and excitements; a way of using the world wide web as a large scale collaboration. Here we will share what we've loved most about our days at Discovery. And since months have passed since the last time we've blogged, I'd like to take a moment to share some of our favorite happenings in 2016. Please leave questions or comments below and we'd love to share ideas! 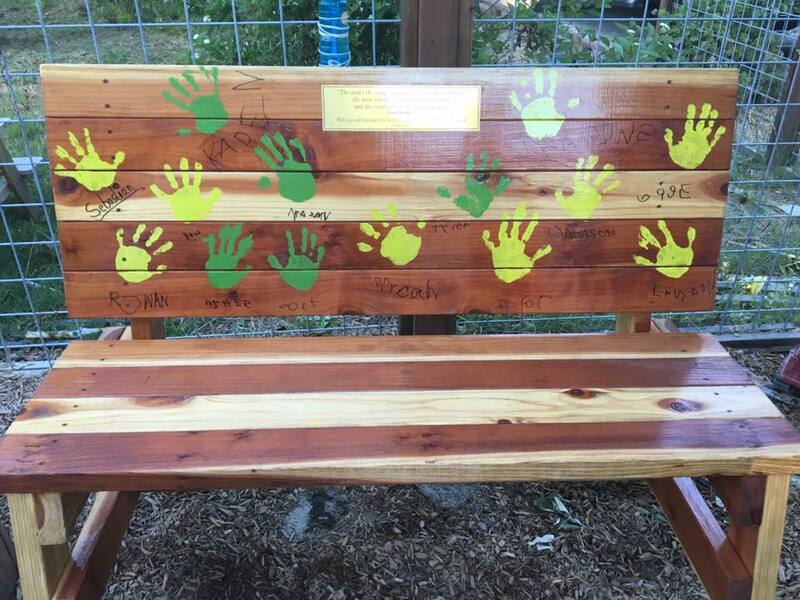 A beautiful gesture and testament to our first group of graduates, they started the tradition of giving a gift to the school on graduation day! Each year, our teachers provide parents with an opportunity to see what their children have learned through this art gallery walk. 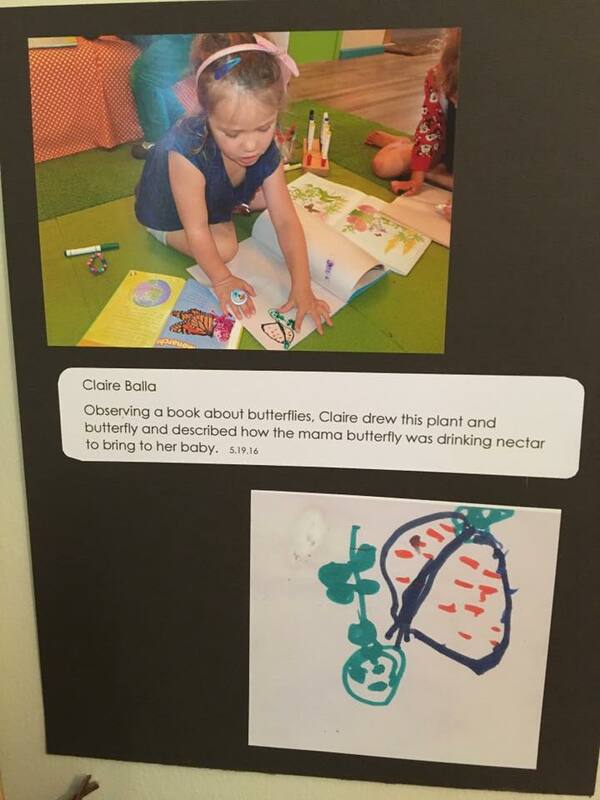 Provocations are found in Reggio inspired schools as ways to observe a child's interest in any given content. These can be used as the beginning of the teacher's path of observation and creation of curriculum. Sitting down to write about the end of this journey, knowing that it's really just the beginning! Besides the birth of my two children and the exhaustingly beautiful reality of parenthood, I can say with absolute certainty, I've never worked so hard in my life! At times, I found myself learning about things that I had little interest in (the legal size of compact parking spaces, how to install a garbage disposal...). But for the most part, I've been having an incredible journey. I've had this vision, for a long time. Close friends used to patiently listen to my ramblings of opening schools with outdoor programs, project based learning, and a dedication to excellent teaching quality. My dreams were huge and I've met many of them. For that I am humbled and inspired by what can come out of dedication, passion and connecting with the right people. The right people: It started with Sandor Kovaks and Joy Smith, the Owners of Santa Cruz Dance Company giving us a moment of their time to hear how we'd love to use their building. I didn't realize at the time what an asset the relationship with our landlords would become! They introduced me to Ellice Apostolos, one of our Site Supervisors. Ellice has been nothing less than an incredible partner in this adventure. Her work with families and teachers is more than admirable. She introduced me to Michele Chaney, our other site supervisor. Michele's work ethic and dedication to extraordinary staff, physical space, and families is astounding. And, despite the many road blocks created by our County, many folks there were very strong advocates for our project, Travis Rieber, Laura Brinson, and Tony Falcone! Lastly, and most importantly, my family showed me exactly what it means to be unconditionally supportive. My husband, Gus, works as a full time third grade teacher and would come home to give support wherever it was needed, dinner, building sandboxes, taking the children to swim lessons, and so much more. My in-laws, Bob and Sarah Balla, after ten years in their family, this last year showed me that we are so truly loved. My parents, John and Kay Bargmann, have the faith and dedication to my ideas that was often put to the test. I can only hope that I am as confident in my own children's choices as they grow. And finally, the support of the families enrolled in our home-based preschool; you're children felt like part of our family, we will always honor the days you chose us as your baby's childcare. I am a stronger woman, mother, and wife because of the beautiful relationships built here in our community. Thank you! Open House coming in one week!!! We can't wait to share our family center with all of you! Meet us here at 2800 Porter St. between 11 and 2 on President's Day, February 16th! What is your vision for childhood play spaces? We are thrilled with the playspace design by Elizabeth Burton! She has developed hundreds of landscapes including aspects of the UC Santa Cruz Life Lab garden. We love the bean teepee, the climbing wall and the human sun dial! We're also open to your input! The grassy mound will be a great place for outdoor performances, but we can't decide on artificial turf or real grass. We love the sentiments of real grass, the smell, the nostalgia of grassy knee stains... but, we also care deeply about doing our part to save water. Any thoughts? "You are so smart to take this decision so seriously. Really think about the type of care you want for your child. Come meet us and see if we fit into that image, that idea. Saying good-bye to your child hurts your heart, deeply. I understand that feeling, I've been there. Talk to your child about the new adventures they'll look forward to at school. Help them feel brave by being brave yourself. Braveness is one of the gifts school gives a child and their family. And Mama, you are brave, you are strong, and you are a warrior. You may not want to be a warrior, not everyday, but your child sees you as their greatest hero, so your decisions for their daily life are ultimately trusted by them. Your child will learn to love other adults, other children; and, at first, this may seem uncomfortable, but a day will come when your heart is so grateful as you watch your child walk with ease and confidence into the arms of his teacher. And finally, I'm on your side; come to me, talk to me, I will listen." Hiring: Who will care for my heart? As the Director, I am honored with the task of hiring. As we embark on the journey to hire our preschool staff, what advice can you give? Who will be educating your child and caring for your toddler? My daughter, Miss C will start with our first preschool class. I take this seriously... how will these people treat my heart as she goes toddling around outside my chest? We were interviewing the other day and I heard myself say "this is the 3rd school I will be a part of opening"! Its true. The first was in the suburbs of San Ramon. I met some of my favorite people while working there. Live Oak Elementary (in San Ramon) was brand new, with new furniture, new projectors, new buildings, everything was new, including the staff. I truly admired the principal there. He was in charge of hiring a staff of somewhere around 30 teachers. He hired a great balance of brand new teachers (like myself) and hard-working veteran experts to guide us newbies in a friendly and non-threatening way. That was the best year I had as a teacher! I was so motivated and inspired by the others around me. My friend Nick and I practiced our '1st day of school routine' for each other a dozen times, trying to get it just right. We were so enthusiastic and dedicated to our work... and loved our team! We created so many school procedures, from how we walk to the lunch room, how we budget our copies, recess schedules and curriculum collaboration. At times it felt overwhelming, but it taught us all that our opinions and expertise were valued. And that's how I learned that teachers first want to feel their value more than anything else! I am now at the point of discussing our hiring practices for our staff here at Discovery Preschool and Family Center. We're looking for that balance of open-minded, caring veteran teachers and fresh and enthusiastic new educators. We want to see a staff eager to do their best and to learn more about the Reggio approach to early education. We want a staff that is excellent at communication with co-workers, supervisors, children and families. We want a staff with a positive attitude, happy to collaborate with others and learn from those around them. So, what are your thoughts? What would ask in an interview? Gus planned to take both kids today for a pleasant morning at the park and maybe a trip to the library. I got dressed grabbed my laptop and headed out the door for a meeting. On the way to my meeting, I gave myself a pat on the back for being organized with my hair brushed, two of the same socks on, and (for once) no dirty diapers in the purse! But, it's never a good idea to get too confident. Twenty minutes into my meeting I heard my phone buzzing... over and over again. I knew it was Gus so I politely excused myself to answer the phone. I had Gus' car keys in my purse. Arrgh! I impishly looked at our Site Supervisor, Ellice and told her I needed to bring keys home. So, we improvised and held our meeting driving back to my house along HWY One. And by the end of today we've officially declared it, Thanksgiving Break! Today we met with our designers from Stripe Design Group (stripedesigngroup.com) and are so pleased with the color pallet. Bright, yet soft and warm…perfect! Before you decide to follow our blog, you might be wondering who we are! My name is Sara Balla and I am passionately dedicated to bringing quality preschool and childcare to Santa Cruz County. When I became a mom, I started looking under rocks for some kind of connection to other women beginning their journey into motherhood. Being Mommy was something I quickly learned couldn't be taught from books or websites or other Mommy blogs. I needed a village of women, the way it was supposed to be, working side by side, laughing and helping, cooing and bouncing, together. And I did; I found moms everywhere, starting at the Sutter New Moms Support Circle, MotherSong, Facebook, the parks, JuneBugs, the Farmers Markets, and everywhere in between. At that time, I had been teaching third grade in the sweet and progressive school, Pacific Elementary in Davenport. Pacific staff holds this amazing balance of tradition and custom, while ironically appearing to have all of the most progressive ideas. I learned here that loving your co-workers and the children is really all it's about. Sprinkle that with ocean air, wholesome food, the banjo, and some Sharks and Minnows, you've got yourself the perfect paradise. Nothing could have dragged me away....until, Miss C, my beautiful baby girl. So, thank you for reading our blog and following our progress. Maybe you follow us because you're interested in childcare, maybe you're just curious about what it takes to open a center, or maybe you just want to know what the Ballas are up to these days!